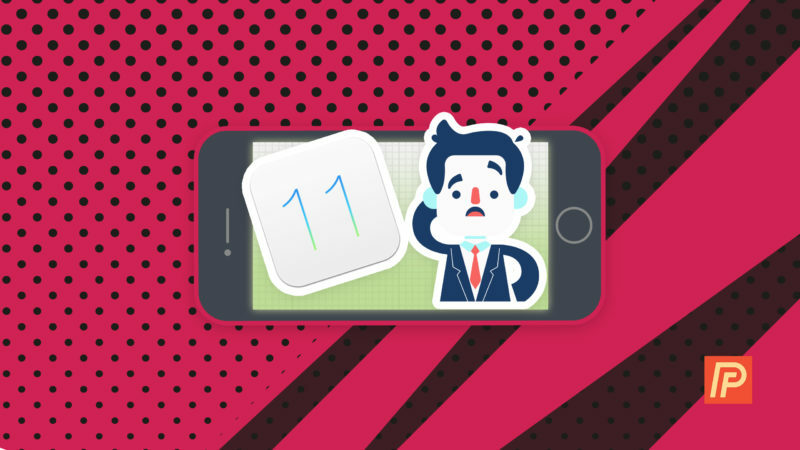 During its 2017 Worldwide Developers Conference (WWDC 2017), Apple unveiled a new Control Center for iOS 11. Although it looks a bit overwhelming at first, the Control Center still has all of the same features and functionality. In this article, we’ll break down the new iPhone Control Center so you can understand and navigate its busy layout. What Are The New Features Of The iOS 11 Control Center? The new iPhone Control Center now fits onto one screen rather than two. 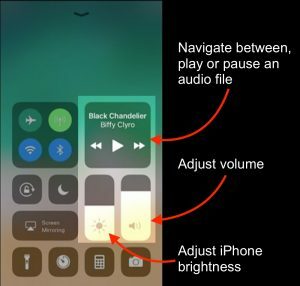 In previous versions of Control Center, audio settings were on a separate screen which displayed what audio file was playing on your iPhone and a slider which you could use to adjust the volume. This often confused iPhone users who didn’t know that you had to swipe left or right to access different panels. 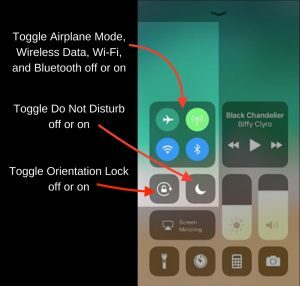 The new iPhone Control Center also gives iPhone users the ability to toggle wireless data on or off, which used to only be possible in the Settings app or by using Siri. The final new additions to the iOS 11 Control Center are the vertical bars that are used to adjust brightness and volume, rather than horizontal sliders we’re accustomed to. What’s Staying The Same In New iPhone Control Center? The iOS 11 Control Center has all the same functionality of older versions of Control Center. The new iPhone Control Center still gives you the ability to turn Wi-Fi, Bluetooth, Airplane Mode, Do Not Disturb, Orientation Lock, and AirPlay Mirroring off or on. You also have easy access to the iPhone flashlight, timer, calculator, and camera. You’ll also be able to connect your iPhone to AirPlay devices such as an Apple TV or AirPods by tapping the Mirroring option. 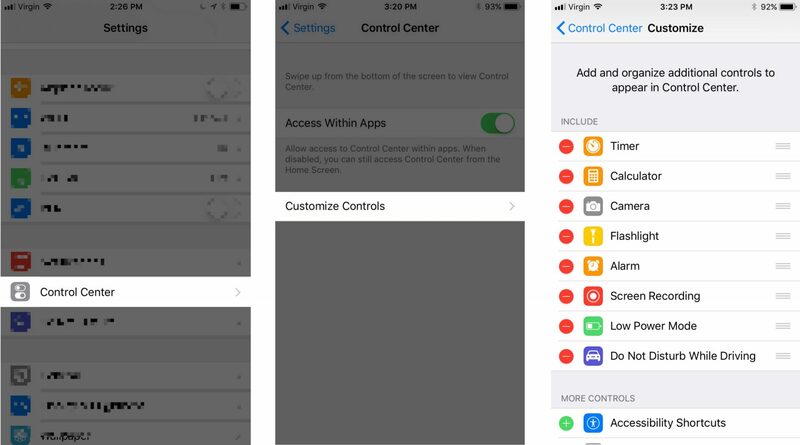 For the first time, you’ll also be able to customize Control Center on your iPhone to include the features you want and remove the ones you don’t. For example, if you don’t need access to the Calculator app, but you do want easy access to an Apple TV remote, you can change the settings of Control Center! Add controls to your iPhone’s Control Center by tapping any of the green plus symbols below More Controls. To remove a feature, tap the red minus symbol under Include. To reorder the included controls, press, hold, and drag the three horizontal lines to the right of a control. 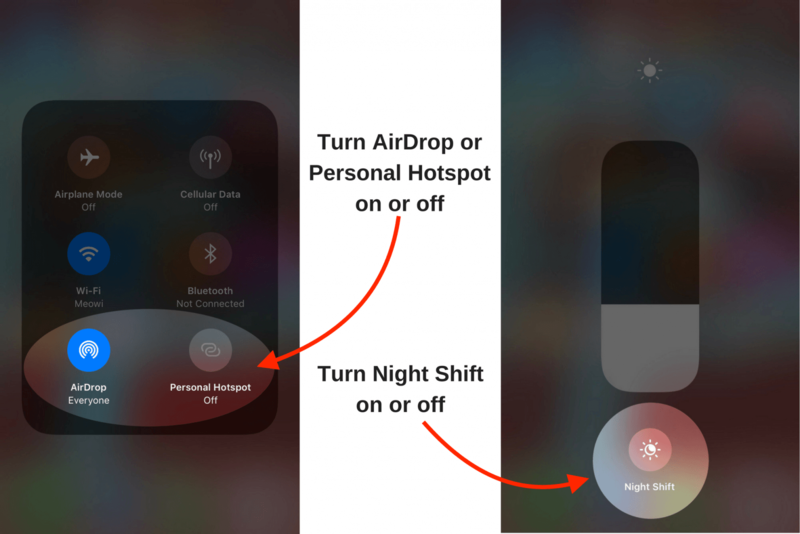 You may have noticed that the ability to turn Night Shift and AirDrop on or off are missing in the default layout of Control Control in iOS 11. However, you can still access these features! To toggle AirDrop settings, firmly press and hold (Force Touch) the box with the Airplane Mode, Cellular Data, Wi-Fi, and Bluetooth icons. This will open a new menu which allows you to adjust AirDrop settings as well as turn Personal Hotspot on or off. To turn Night Shift on or off in the new iPhone Control Center, firmly press and hold the vertical brightness slider. Then, tap the Night Shift icon at the bottom of the slider to turn it on or off. The New iPhone Control Center: Excited Yet? The New iPhone Control Center is just our first glimpse into iOS 11 and all the new changes that will come with the next iPhone. We’re very excited and we hope you’ll leave us a comment down below so you can tell us what you’re most excited about. Previous ArticleClear Browser History On iPhone & iPad: The Fix For Safari & Chrome! Next Article Twitter Not Working On Your iPhone Or iPad? Here’s The Real Fix!